Credit & Copyright: David Martinez-Delgado (MPIA, IAC), et al. 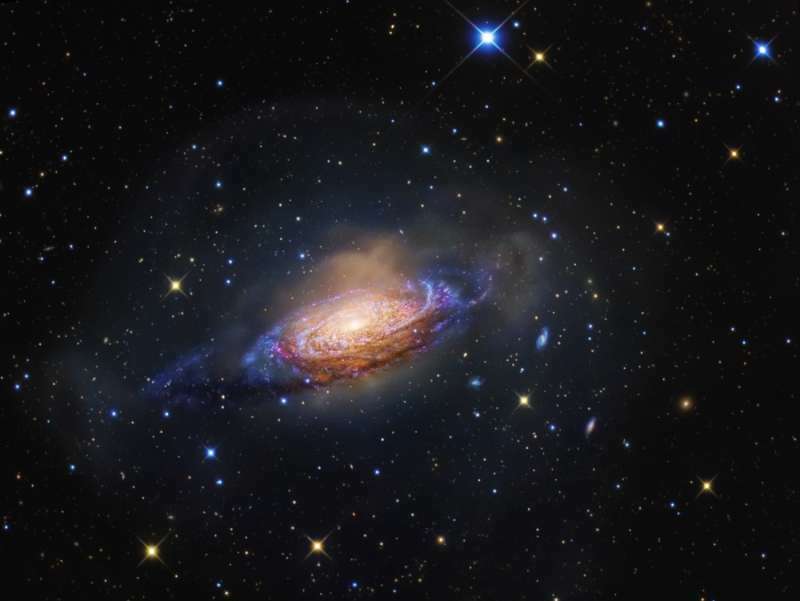 Explanation: Gorgeous spiral galaxy NGC 3521 is a mere 35 million light-years away, toward the constellation Leo. Relatively bright in planet Earth's sky, NGC 3521 is easily visible in small telescopes but often overlooked by amateur imagers in favor of other Leo spiral galaxies, like M66 and M65. Its hard to overlook in this colorful cosmic portrait, though. Spanning some 50,000 light-years the galaxy sports characteristic patchy, irregular spiral arms laced with dust, pink star forming regions, and clusters of young, blue stars. Remarkably, this deep image also finds NGC 3521 embedded in gigantic bubble-like shells. The shells are likely tidal debris, streams of stars torn from satellite galaxies that have undergone mergers with NGC 3521 in the distant past.